In this typical japanese vegetable garden, everything is caged, even the flowers. really?!?! Is there a reason for this practice? I like to garden myself, so I am very curious! Hi Christine, glad you liked it! 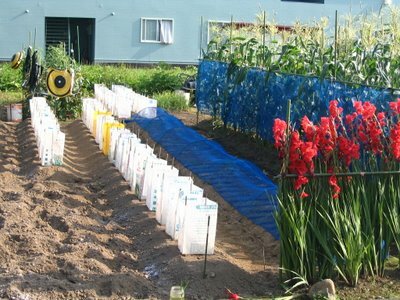 I think, the white plastic bag "cages" are to protect some small vegetable plants against wind or animals, the maize is protected against birds and the flowers - well, I think that is to avoid that they break. I will post other garden photos here soon!